Rid'em Cowbay Western Cotton Fabric. Perfect for quilting, apparel and home decor accents. Colors include shades of green, brown, red, blue, and cream. 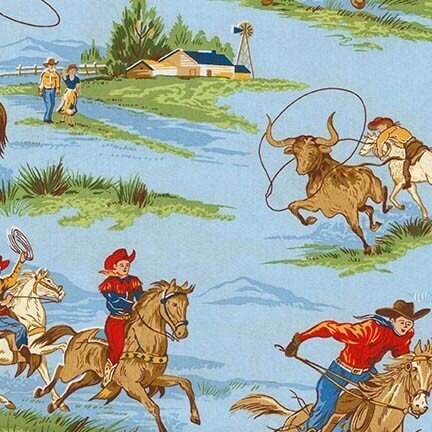 What a great piece of fabric to add to your western fabric collection. Add this fun piece of fabric along with the other fabrics from this line and you can put together a quilt to showcase your western theme. All fabric from The Quilted Nursery is cut directly from the bolt and sold by the yard. If you require special yardage please contact The Quilted Nursery Fabric Store by conversation and we will accommodate your request. The Quilted Nursery Fabric Store offers same day shipping, always. Precious fabric, haven't used it yet , but it is cuter than I imagined! !